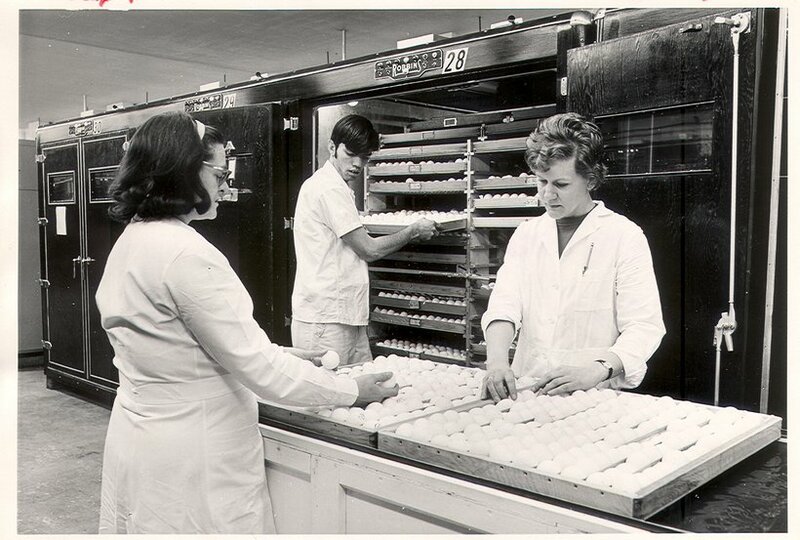 The photo above, taken in 1972, tells a compelling story about the evolution of hatchery technology. Today’s hatcheries are designed for resource efficiency, biosecurity, and built-in controls to produce the best quality bird. Modern incubators are now automated and carefully control every aspect of the environment for millions of eggs that will eventually produce day-old chicks or poults. Ron Jöerissen is the Director of Operations and Global Services for the Layer business unit and has witnessed the change in hatchery technology first hand. Read on for some of his insights into what new technology has meant for the hatcheries in our organization and views to the future. What are some of the biggest changes in technology in the hatchery? By far the biggest change in the hatchery industry was the move from multi-stage to single-stage incubation. With single-stage incubation, environmental controls can now be automated further and carefully controlled all in one incubator in alignment with the stage of incubation of all eggs in each machine. Advantages of single stage incubation include better biosecurity and less manual labor needed, which means fewer errors in incubation. In previous years, the cost to operate single-stage incubators was much higher than multi-stage, but with investment in heat recovery systems, the cost is at least equal. All these advancements with single-stage incubation has resulted in better hatchability and day-old chick/poult quality. Air handling is another area of improvement. With modern technology in heat recovery systems, all incoming fresh air is now conditioned before usage. In new hatcheries, the exhaust air from the setters is not reused anymore , and most often, all air is used only once before being exhausted to the outside. New heat recovery systems use returned cooling water from the incubators to precondition the fresh air before it enters inside the incubators. What are some examples of improvement in efficiency, biosecurity, worker comfort and safety, and in producing a better quality chick or poult? 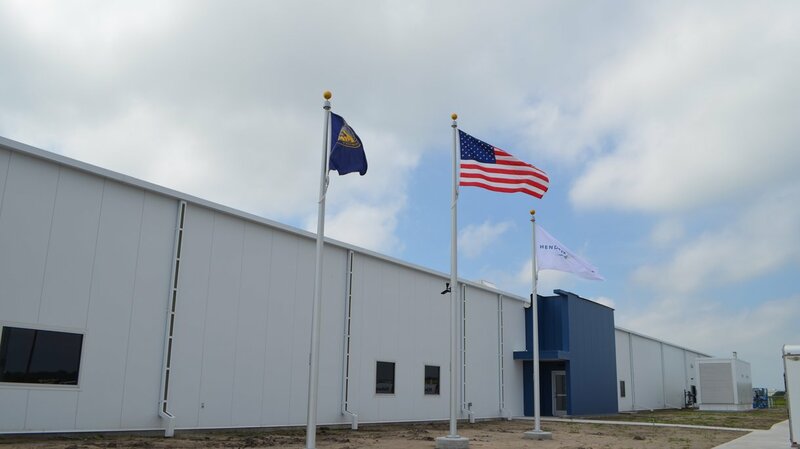 When building new hatcheries and remodeling existing facilities, the most important factor to create a modern, efficient hatchery is to create optimal product flow inside the facility. It’s easier to create this flow of traffic when building a new hatchery, but this can also be enhanced within a remodeling project. One-way product flow, without the possibility of cross-contamination between eggs, animals, people and air, is the most effective way to improve on general biosecurity inside a facility. Not only for biosecurity purposes, but also overall efficiency is highly improved with a more optimal product flow. We’ve also witnessed investments in new incubators that are equipped with the latest standard in insulation, sealing of doors, hardware materials, building and incubation monitoring software programs, which provide ways to optimize the total incubation process. More efficient and centralized equipment for cleaning and disinfection together with new designs of flooring, drains and pits, are ideal to optimize cleaning processes and enhance general biosecurity standards. More attention is also given to general automation systems to handle eggs and chicks/poults. This is especially important for final product hatcheries as more numbers need to be handled per hatch day. Candling of hatching eggs at day of transfer is another good way of reducing waste by selling clear eggs as by-products. Taking out clear eggs at transfer also promotes chick/poult quality during the last stage of incubation. Finally, we’ve seen great opportunities for more attention to worker comfort and safety when designing a hatchery by optimizing the working space and installing good quality shower-in facilities and breakroom areas. What are the important trends that you see for hatchery technology in the future? More automation? More energy/resource efficiency? There will be further developments of automation and energy efficiency in the years to come, but by far the most important trend for the layer industry will be the evolvement of in-ovo sexing. This will also involve implementing this brand new technology within existing facilities or investments in dedicated hatchery facilities. Depending on local requirements, it will differ how quickly this kind of technology needs to be implemented. However, we know that it’s no longer a question of if this technology will become available for the layer industry, but when it will become available with reasonable capacities and costs, and at what time it needs to be adopted. Next to that, there is a lot of interest and activity to find ways to further monitor the growing embryo by non-invasive methods and physiological signals during the total incubation process. Keeping an eye on the embryo wellbeing within the incubator real time and using this information to manage environmental conditions inside the incubator, is a development that provides great opportunities for animal welfare, efficiency, quality and planning challenges.